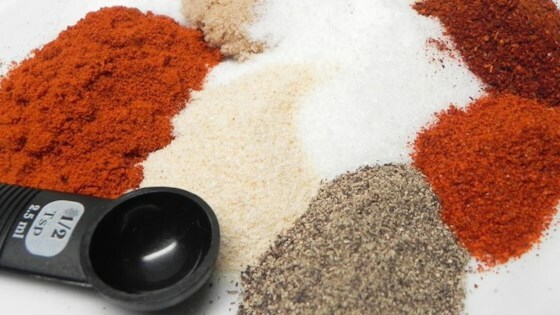 "This is a wonderful and spicy rub that goes great on beef or pork ribs! Put it on ribs lightly to get a nice kick and put it on heavy to get a bold hot dish!" Combine brown sugar, white sugar, paprika, salt, onion powder, cayenne pepper, black pepper, garlic powder, and chili powder in a bowl. the perfect all purpose dry rub! It’s wonderful! Everyone lives it on chicken. Loved it! I also added about 1/4 C. ground coffee & made a rub for ribs! My family loves this rub on pork or chicken. It can get a bit spicy. Use only half of the cayenne pepper. Looks dry on the outside but seals the flavors and juices into the meat. Excellent rub.